1 When the province of Quebec was split in 1791, many things changed. What had been a single province was now two. Upper Canada was the English part. 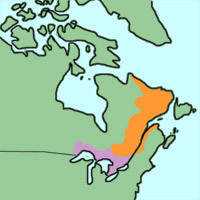 Lower Canada was the French part. Each province had its own government. 2 The first part was the Legislative Assembly. This was to be like the House of Commons in Britain. It was made up of bankers, store keepers, and other merchants. They were elected to the Assembly. 3 The second part was the Executive Council. This was like the House of Lords in Britain. This was where the power was. The Assembly could make any laws they liked. If the Council did not like them, however, they could not become law. The Council had much more power than the Assembly did. 4 The third part was with the Lt. Governor. It was his job to rule the colony and take care of its daily needs. 5 Lt. Governor Simcoe was the first of many for Upper Canada. He thought it would be good if his friends were in the Executive Council. He wanted Upper Canada to be like England. 6 Simcoe did not stay in Canada very long, but his ideas did. It was not long before the Executive Council was called the Family Compact. 7 The men in the Council were all wealthy or from the upper class in England. They decided how things should be done to suit themselves. It did not matter much if it did not help the other people. 8 The average people in Lower Canada had the same problems and more. Most of their Executive Council did not even speak French. It did not take long for the former French colonists to become unhappy.